...and I've just completed Harry Potter and the Deathly Hallows. You won't find any spoilers here, since half the fun of the series is finding out what happens next, but I will say this: You won't be disappointed. For readers that have stuck with the series since the beginning, this seventh book is a fitting, bittersweet end to the Harry Potter story. It's also the best in the series. 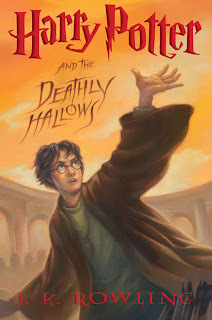 Maybe it's because each book matures along with the characters, maybe it's because J.K. Rowling has grown as a writer, but Deathly Hallows has the most gripping narrative of any of the books, with a great deal more action and twists and turns that will make you rethink just about every plot point in every previous book. Not to mention the fact that it's dark as hell, with major characters getting killed off or maimed left and right. Again, I won't spoil a thing. The final chapters were reminiscent of the final scenes in other fantasy epics: Lord of the Rings: Return of the King and Return of the Jedi immediately come to mind. Mark my words: it's gonna make for a fantastic movie. My one gripe? At one point in the book, the plot devolves into Harry, Ron and Hermione tracking down two possible groups of magical objects. That's too many MacGuffins. Of course, the dual quests for Horcruxes and Deathly Hallows resolves itself in the end, but it overcomplicated the plot a bit, and the fact that it takes a whole chapter toward the end of the book to explain all the connections was kind of a letdown. With two more movies to come, Potter-mania shows no signs of slowing down. And for someone who came into the series pretty late in the game, I'm glad that I got the chance to catch up on what I missed and see it through to the end. It's hard to ignore a phenomenon that's introduced so many children to reading, while at the same time has reintroduced so many adults to a world of childlike wonderment that is often, although we hate to admit it, quite difficult to find these days.